You may receive updates from Swing Left, the sponsor of this event campaign. You may receive updates from Swing Left Pioneer Valley - Western Mass and Swing Left Greater Boston, the sponsors of this event. You may receive updates from Diane Garey, the creator of this event. It's time to get to work on 2020! Want to help UNIFY DEMOCRATS and build an even BIGGER BLUE WAVE in the 2020 election? Come and spend an hour and a half with us to impact the 2020 elections using the "Super State" Strategy developed by Swing Left. Check out this 5 minute video. We will bring all the letter writing materials, and you add your comments and inspirational messages! 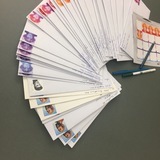 Donations of $10 or so to cover the cost of stamps and printing are appreciated, but not required. >> Gateway City Arts will open their beer garden that day, and the bistro will be open for coffee! Welcome spring! By clicking RSVP, you agree to Swing Left’s Organizer Liability Statement.